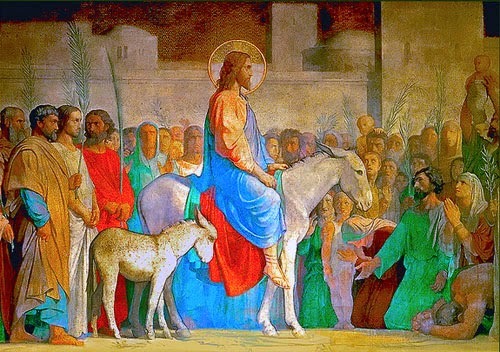 Jesus rode a donkey went he came into Jerusalem on what we now call “Palm Sunday.” Though the crowds did not realize it, he was entering as a humble servant who would be “obedient unto death, even the death of the cross” (Philippians 2:8). But when he comes again at the end of the age, he will be riding a white horse, and all those who belong to him will go forth to greet him as Conquering King. What then shall we say to these things? If God is for us, who can be against us? He who did not spare His own Son, but delivered Him up for us all, how shall He not with Him also freely give us all things? Who shall bring a charge against God's elect? It is God who justifies. Who is he who condemns? It is Christ who died, and furthermore is also risen, who is even at the right hand of God, who also makes intercession for us. Who shall separate us from the love of Christ? Shall tribulation, or distress, or persecution, or famine, or nakedness, or peril, or sword?